By buying this product you'll earn up to 417 Rewards points. In-ceiling speakers with a little extra "oomph"
A room with high ceilings can be an excellent space for your business, but standard in-ceiling speakers aren't always loud enough to be heard clearly. That's where the SoundTube CM690i comes into play. This powerful speaker produces high-SPL (sound pressure level) output — up to 111.5 decibels. 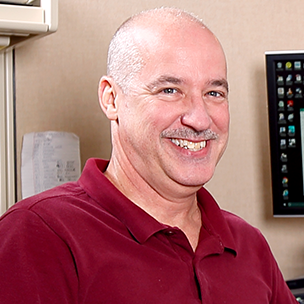 You can rest assured that customers and employees alike will be able to hear music and announcements clearly. If your job requires a tile bridge please let your advisor know and we will include one free of charge. 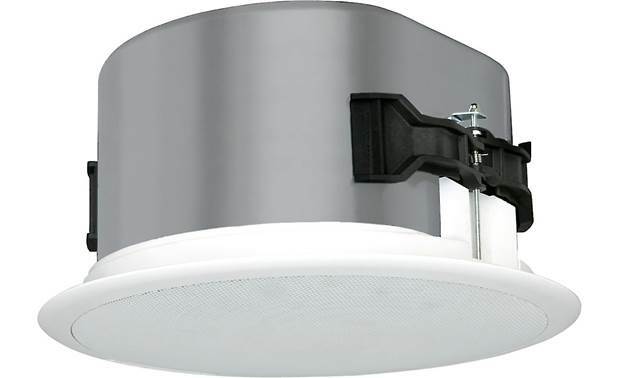 Overview: The Soundtube CM690i is a 2-way, blind-mount, in-ceiling speaker featuring a coaxially mounted 6.5" woofer and a 1.42" compression driver in a drawn aluminum backcan and ABS baffle. The speaker features transformer tap settings for 25, 70, and 100 volt operation, and also includes an 8Ω bypass. Designed specifically for high-SPLs and long-throw applications, the CM690i is ideal for nightclubs, gyms, arenas, theme parks, shipping centers, and similar applications. 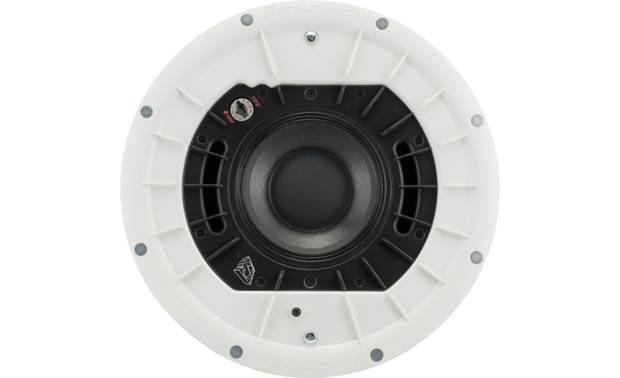 Drivers: The CM690i features a 6.5" treated fiber cone woofer with a cloth surround along with a 1.42" titanium compression driver with waveguide, all mounted in a ported aluminum backcan enclosure. This combination delivers high efficiency and performance across the operating bandwidth with a frequency response of 73 Hz to 22 kHz (-3db). Able to handle up to 100 watts RMS (200 watts Program power) and with a sensitivity of 91.5 dB, the CM690i can provide clear powerful sound with a coverage angle of up to100˚ (averaged from 2 - 10kHz). Enclosure: The CM690i is housed in a cast aluminum backcan with a ported ABS plastic front baffle providing added musicality with a bass response down to 62 Hz (-10 dB). Soundtube's BroadBeamHP waveguide technology delivers a consistent dispersion pattern for maximum intelligibility and edge-to-edge coverage. The speaker includes a powder-coated steel-mesh grill that can be painted to match the room color and includes an attached safety restraint lanyard. The grill is magnetically held in place on the speaker, making installation and removal easy. The CM690i enclosure carries both UL1480 and UL2043 UL certifications and is CE and RoHS approved. Mounting: Installation of the speaker is done blind-mount using a constant-tension fixed-wing mounting system. Two winged assemblies come pre-mounted to each side the speaker. Once the speaker is slid into the ceiling opening 2 Phillips-head screws on the front of the speaker are tightened. This expands out the mounting arms providing tension on the backside of the mounting surface. The CM690i can be mounted to ceilings ranging in thickness from 0.25 to 1.91 inches, including drop-ceilings using the optional Tile Bridge. A secondary attachment point is provided on the back of the speaker for the provided safety cable. Dimensions (incl. 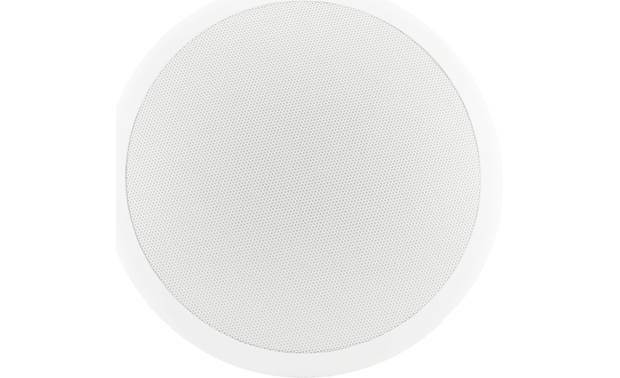 grill): Diameter - 14.875", Height - 8.750"
Dimensions (w/o grill): Diameter - 13.875", Height - 8.50"
Searches related to the SoundTube CM690i 6-1/2" high-output commercial in-ceiling speaker.